What an awesome turnout for the first ever Typism http://typism.com.au conference on the Gold Coast. A room full of passionate font geeks ready from 9am to take in a full day of font frothing. The speakers were awesome, thanks to our host Dominique Fella. For me the highlights were from local brand designer Matt Vergotis who I could have listened to for another 5 hours on brand strategy, logo development and client relations, and Brisbane printmaker Nicole Phillips who seems to have ink flowing in her veins. I have never heard anyone speak more articulately & passionately about print, ink & press. Wayne Thompson, founder of http://www.atf.com.au was truly inspiring. To get an understanding of the time and energy that goes into designing a full type family including weights and glyphs blew me away. Thinking back on it now, all the speakers were completely engaging and they all brought a clever, insightful depiction of their life with typography and I was captivated throughout the day. 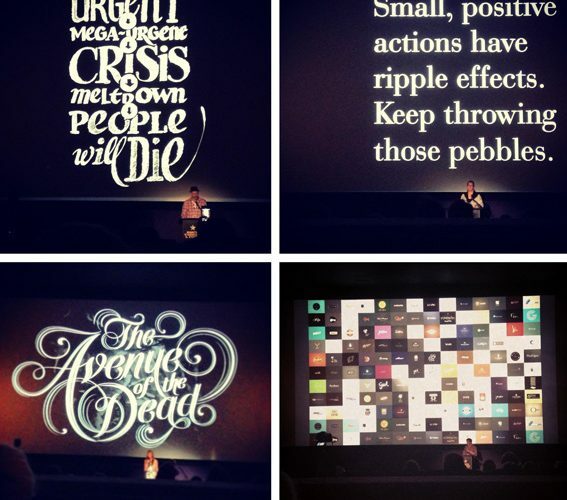 I’m totally chuffed that finally the GC has a platform like Typism, for designers to share their experiences. Typism delivered a massive exclamation mark! Cant wait for the next one! Kris Hauselberger, Art Director, Copirite Design Print Web.